Celeriac, also known as celery root, resembles celery above ground but the difference lies beneath the soil. 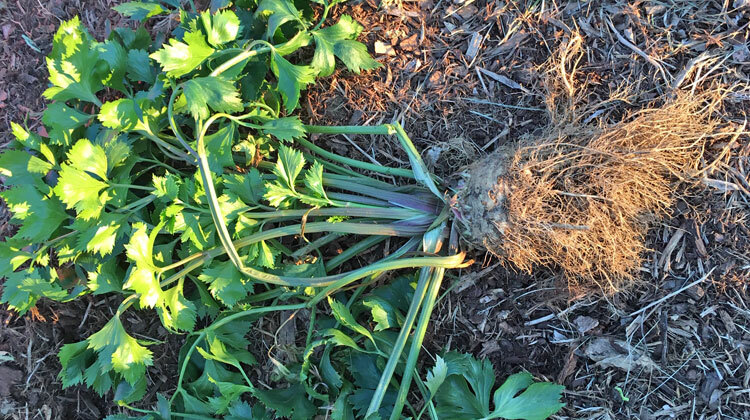 It’s easier to grow than its close relative celery and prized for its crisp celery flavored root. Peel the outer skin of celeriac prior to serving. Briefly soak in water with a bit of vinegar or lemon juice to prevent browning. Add it to soups and stews or eat it raw as a snack or grated on a salad. Balance its intense flavor by combining it with fruits and vegetables like apples, carrots and beets. Grow celeriac in full to part sun and moist soil. It’s ready to harvest in about 110 to 130 days depending on the variety. Purchase transplants or start seeds indoors if your gardening season is short. Gardeners in zone 7 and warmer areas can plant celeriac in summer for a winter or spring harvest. A bit more information: Try roasting the whole root at 375°F. Just wash, coat with olive oil, your favorite herb and a bit of sea salt. Wrap in a double layer of foil and cook for about 2 hours. For more recipes visit onegreenplanet.org.